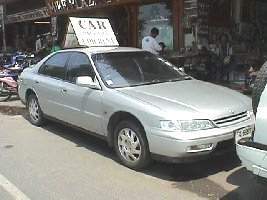 Our Service Partner for Pattaya Taxi & Transfer Services is opearting 24 hours 7 days a week. Prices are iclusive of service charges and government tax. 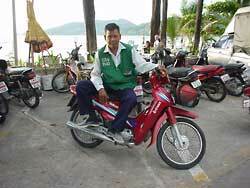 On most routes a deposit payment as low as 200 Thai Baht is sufficient to secure your transfer. for a "Hired" ride. But many Tourists have complained of over charging by more than a few drivers of these modified pick-up trucks. Please Set the Price in Advance and have correct change. We strongly suggest you smile and be overly friendly when bargaining with the drivers. A Good(Gods) Attitude will Return the Same. If you yell and get angry expect the same or worse in return. You will learn how to use them in a few days and they really are a bargain for the money. For "In Route" just jump on without saying anything and hit the Bell Switch on the Roof to Stop. 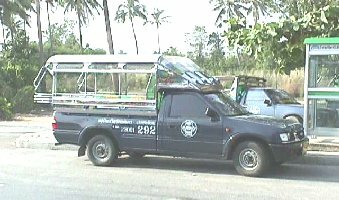 Banglamung District Baht Bus Cooperative # 221-271 or # 423-554. Although it's a Dangerous Ride, it is a lot easier to bargain with the M/C Taxi drivers. Bi Cha Cha (21k) Go Slowly ! 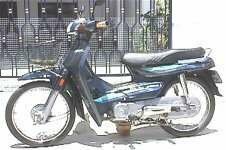 If you know how to ride a motorcycle then this is the best transportation around Pattaya. You will find many Thai Rental shops on the streets of Pattaya. Also many expats who live here have set up rental businesses for their Thai wives. You will find these shops have not only better prices, but their bikes are better maintained and therefore safer to use. 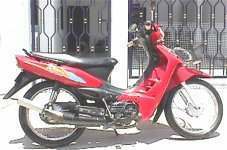 Be Informed that driving a Motorcycle in Pattaya is Dangerous, Go Slow and be Careful. Driving is on the Left Side. You will also need an International Drivers License and a Helmet, and don't forget the kickstand ! 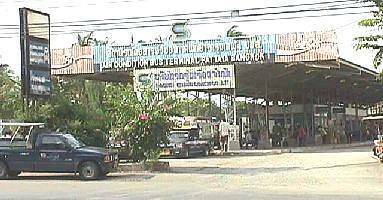 Again you will find many shops that rent jeeps and cars on the streets and Hotels of Pattaya. Try to make sure it has full insurance. It will cost a little more to rent but worth it. Many street shops don't fully insure. When renting any vehicle first walk around it and write down any dents and scratches on the back of the rental form. This will save you problems upon return. You will also need an International Drivers License. This is the best way to go. For approx 500 Baht (one way) you will go Directly to Bangkok Airport ( Suvarnabhumi or Don Muang International ). They have both buses and vans. Times are 6:30am, 2pm & 6:30pm to Bangkok and Return 9am, 12noon & 7pm to Pattaya from Don Mung Airport. Look for their booth and waiting lounge inside the airport (arrival). This is also the best way to get to Pattaya. Try to schedule your air flite accordantly. There are also airport taxis at the airport for ~1500 - 2000 Baht. Driving Time to Bangkok ~ 2 1/2 -3 hours. 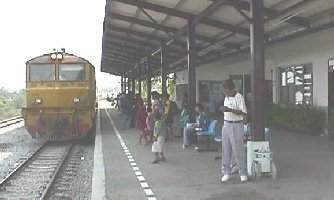 Airport Bus to Don Mung - 7am, 9am, 11am, 1pm, 3pm & 5pm. There are both air-con and non-air buses that pick up passengers on the Sukhumvit Highway every 10 to 20 minutes all day long. Wait at the bus stops. Pick the air-con buses if you don't like dust ! 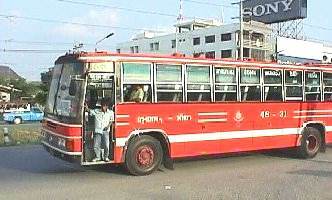 The drivers of both buses like to play with their horns a lot. 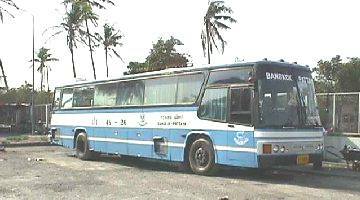 If you are not going all the way to Bangkok then use these buses. If you are only going a short way then there are White Baht Buses on the Highway. In Central Pattaya. Across Sukhumvit Road. Off Siam Country Club Road.